A 3,000 square foot house for a family of four in a changing neighborhood maximizes site usage by organizing exterior areas as part of the spatial composition. This outdoor room is defined by the double-height living/dining wing and two light-monitored two-story volumes. The rear volume contains two bedrooms on the ground level and a master bedroom suite above. The street-facing volume serves as a separately accessed art studio for the owner. 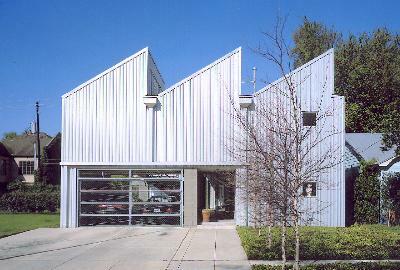 Material selection of concrete block and metal siding reinforce the conceptual organization.